Elle: People are tired of surprises and twist endings. Although Polanski made his outstanding movies so far, this one is remarkable as the one before, La Vénus à la fourrure. Based on only two characters, the story reveals psychological movements in human behaviour, with one who is opened and unsecure and the other, who is actually dictating everything, in disguise, towards the goal it wants to achieve. Eva Green and Emmanuelle Seigner are really good pair and great match for this plot. 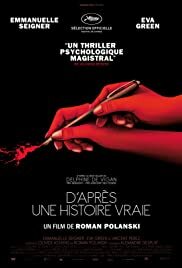 Reccomendation for all of the Polanski's lovers.